Entrepreneurial vintner Rodney Gagnon brings a breath of fresh air to the world of wine clubs with his innovative new Glasshaus Wine Company, the first community-supported winery within the premium cool climate Petaluma Gap growing region of Sonoma and Marin Counties. Think CSA farm boxes, but Rodney's case, premium, limited production, handcrafted Pinot Noir and Chardonnay. Just like buying into shares of an organic farm in the area and enjoying the boxed bounties of harvests, the tech-exec-turned Glasshaus Wines Founder and CEO's community supported winery concept offers fine wine lovers shares of the year's specific vintage. Glasshaus is currently accepting registration for inaugural members for its upcoming 400 case 2013 vintage. This promises to be another exceptional year for Pinot Noir and Chardonnay. Rodney's wine will be made right here in the region from ultra-premium grapes sourced from award-winning, third generation family-owned Sangiacomo Vineyards. First class wines of the quality Glasshaus will produce, also made from Sangiacomo fruits typically retail for around $45 and upwards per bottle. Bordeaux-trained, Boston native, Rodney is selling shares for a case of comparative Glasshaus wines to members at $364.80, which breaks down to $30.40 a bottle. That's a 25% savings for the wine that is crafted using the same high-end methods and fruit as some of the most sought after in wine country. Glasshaus wines sold in retail will be limited to local shelves and restaurants. Share price to members represents a 20% discount on the retail price. But, apart from the fact that an out-of-the-box, crowd-funded winery of this kind is the coolest way to source the best local wines, Rodney's vision for Glasshaus goes way beyond cutting out the middle man to save us money on premium wines. "Drink Well, Do Good" is the company's trademarked motto. "By the time I've sold all the shares to each year's vintage, Glasshaus will donate 20% of its share sales profits to youth mentoring programs, starting with Mentor Me Petaluma," said Rodney, a board member of Mentor Me, and former Big Brothers Big Sisters mentor, in Boston. Understanding the growing demand for corporate transparency and accountability, Rodney has painstakingly devised a business that provides its members with unparalleled visibility into its operations, its data, annual reports and philanthropic mission. By avoiding traditional distribution and marketing costs, direct sales will enable savings to be passed on to the community. If all goes as planned with share sales in 2013, this year's vintage will put some $17,000 into the coffers of Petaluma's Mentor Me program. Members around the country are encouraged to nominate their own community's mentoring programs as recipients of each share's 20% profits. Rodney moved to Sonoma County in 2010 after 20 years as a high tech executive on the East Coast, San Diego and Los Angeles. Back in 2006, after engrossing himself in a two-year Masters of Wine certificate course at Boston University, the wine industry worked its charm and changed Rodney's life path. "I discovered a true passion to create something," he said. 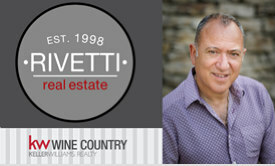 After selling his loft and quitting his job he moved West to further his viticulture studies at U.C. Davis. "While I was there, an opportunity for a six month internship at a vineyard and winery in Bordeaux could not have landed in my lap in a more perfect place at a more perfect time to start my second career." In France Rodney learned just about everything from land to label. Rubbing shoulders with the region's top winemakers, he was welcomed into the fold. After taking a job with an American company's Bordeaux affiliate, his next step was back to the States with a wine sales position in Oregon. "Northern California was more my style," said Rodney, who, after discovering the small-city charms of Petaluma and its rustic surrounds, fell for its rich sense of community and purpose and decided to stay. "I wanted to create a business in which everyone wins," he said, of Glasshaus, which he launched in January 2013. "I have been so impressed with the crowd funding movement, Kickstarter and especially CSA programs from farms such as Tara Firma, in Petaluma," said Rodney. After much deliberation he came up with the idea of instigating a similar concept within the wine industry. After all, he has all the ingredients for success: expert knowledge of Burgundian wine making practices, sales experience, a wealth of business and online expertise. Paired with a passion for mentoring, Glasshaus (meaning see through) was born. "I want to make a difference, I want to make an impact," said Rodney, who is, in effect, selling futures in wine. Share holders buy in on a vintage-by-vintage basis. Six bottles of Chardonnay and six of Pinot per case. Rodney diligently sends out monthly vineyard reports, winemaking data and annual reports. As the company further develops, shareholders will be invited on vineyard tours and to participate in wine education programs, even have a chance to get stuck in for the annual crush and press. Members only harvest and release parties are in the pipeline. 2013 Glasshaus wines will be delivered to shareholders in the Fall of 2014. To learn more about the company and how to become a member click here to visit the Glasshaus website. Find Glasshaus on Facebook and Twitter.